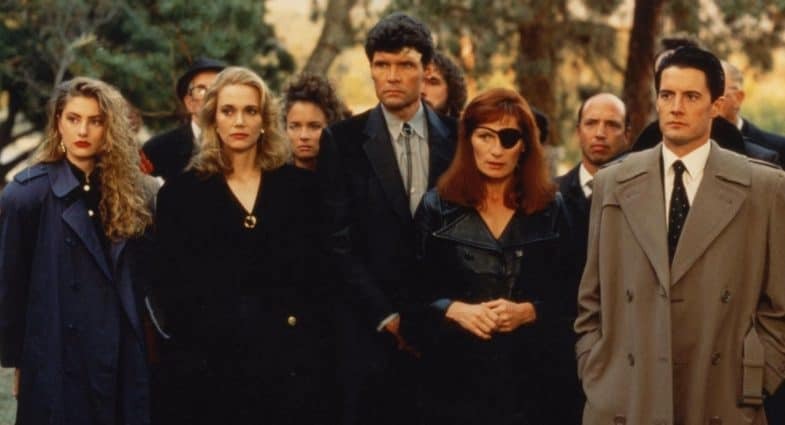 Twin Peaks is an anomaly, a weird and disturbingly dark show that found mainstream success and syndication on ABC in 1990. The show takes a police procedural and completely turns it on its head. As a small town grapples with the murder of a popular teenager, the show asks a simple question- "Who killed Laura Palmer?" The town locals along with help of the eccentric yet lovable Special Agent Cooper try to solve the mystery of Laura's death. Twin Peaks features an extensive cast of local fixtures who are mainly up to no good. If I were to describe the feelings invoked while watching Twin Peaks, it's like returning to your childhood hometown, only to discover that it is much darker than you remember. You realize that people and places can have false faces and that a more sinister nature lurks underneath. One of the reasons why the show works is because of its use of parody. Everyone seems to be having an affair and the characters are caught up in some truly nefarious acts such as drug dealing and prostitution. There is even a parody soap opera called "Invitation to Love" which can be seen on local tv sets. Also, for a show that is nearly 25 years old, the writing and character development are superb. The defining characteristic of Twin Peaks is the surrealism. Visionary director David Lynch, of Eraserhead and The Elephantman fame, brings his signature style to the small screen. After a legendary first season, I feel that Twin Peaks jumps the shark in the second and final season when the killer's identity is revealed. The bizarreness and ensuing violence left a sick feeling in my stomach like swallowing too much water while trying to bob for apples. In conclusion, Twin Peaks is often regarded as a cult classic who found both critical and international acclaim during its original run. Twin Peaks redefined television as a medium and has served as the inspiration for several shows such as The Killing, Bates Motel, True Detective, etc. The theme song will haunt you as you try to piece together the enigma wrapped in a dream. Should you find yourself in Twin Peaks, might I recommend the Great Northern Hotel, a clean place, reasonably priced. I watched some of the season one episodes, but didn't get too far into the season... yet. Glad to know this about the movie though. Doesn't sound like something I want to see. My wife and I watched all the tv episodes. Then We found out there was a movie. We were like great we really liked the tv shows. So we started to watch, we could'nt make it thru. It was so disturbing we could'nt finish it. Its a shame, but it just got to crazy. @vkimo yeah, I watched the whole thing on a 2nd attempt, it doesn't help that the 2nd season is over twenty episodes long. I was compelled to finish it based out of curiosity and even though the WTF momements don't always add up to a neat resolution, it's the experience which makes it entertaining. I have a lot/hate relationship with Twin Peaks. I've tried on 3 separate occasions to watch the entire series which shouldn't be hard since it was only 2 seasons. I love the setting, the nostalgic mist that seems to permeate through the TV. It does get a little weird so keeping an open mind is best. The intro is downright hypnotic and while I usually fast forward through an intro, I always watch the saw cutting the steel. Maybe the next time it's so cold and rainy I can't do anything else but lay back, I'll try to finish the rest of it. I'm glad you posted this article, E. I have never seen an episode of the show myself, but it always seemed so strange to me in the promos for the show. Yet it was indeed a big hit and seems to still have a cult following. When you mentioned the show "jumping the shark", as a result of the killer's identity being made know, it reminded me of a similar thing that happened with the show, "Ed". I really enjoyed that show for many of the same reasons you mention here... specifically the small town atmosphere that the show takes place in. When Ed finally marries the lead female character (played by Julie Bowen of Modern Family fame), the show just kind of lost it's gusto. It didn't carry on many episodes after that. As much as you really want to see the marriage happen, you end up regretting that it did.